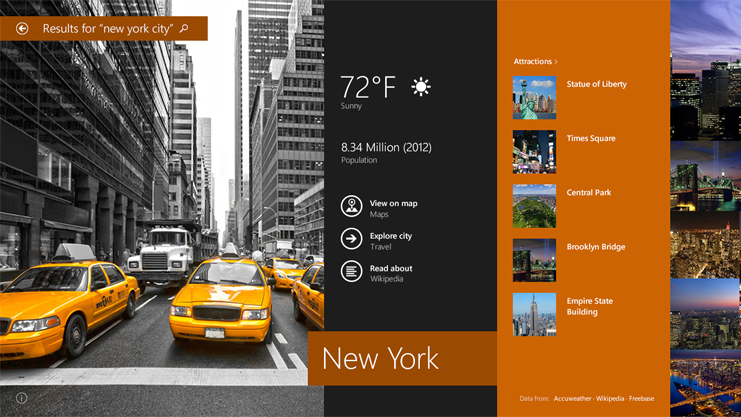 Microsoft released a preview version of Windows 8.1 yesterday. The update includes the heavily discussed ‘Start Tip’, which is the successor of the Start Menu and many other new features and improvement. Windows 8.1 Preview can be installed from the Windows 8 Store only for now, Microsoft will make a downloadable ISO available later too. A lot of the information on the Windows 8.1 update has already been released and several builds already leaked. Something that wasn’t announced previously is that the update will bring support for high resolution screens. As laptop manufacturers are releasing devices with resolutions of up to 3200 x 1800 pixels, some OS elements become too small. Microsoft solves this by making it possible to scale elements. Windows 8.1 makes it possible to scale up to 200% where it was previously possible to scale up to 150%. The scaling option is available for both Metro (Modern UI) and the traditional desktop. The 8.1 version also brings an update Windows Store. It should be easier to find new apps and Microsoft will add recommendations for apps. This is no luxury as the company hopes to welcome the 100,000th app this month. New apps will also appear in the store, among them are apps for Facebook and Flipboard. Windows 8.1 will also support 3D printers and the update should make it easier for developers to make apps supporting them. Discussions around Window 8 are usually around two subjects, the Metro interface and the removal of the Start Menu. While the company has announced that it has listened to its customers, it hasn’t brought back the latter. Instead it went for a comprise, the Start Tip. This will be a small button on the bottom left of the screen which gives an overview of all applications on the computer in Metro style. The update also brings the possibility to boot directly to the traditional desktop and it has an option to remove the ‘hot corners’ functionality. Also the search functionality should be improved and Windows 8.1 should make it easier to stream content to other PCs running Windows 8. The preview can be downloaded from the Windows Store. Microsoft recommends to do this if you are an advanced user. Once the preview is installed there is no way back, it can’t be uninstalled.